The Cullinan Park Conservancy is a non-profit group charged with the promotion, enhancement and protection of Cullinan Park at Oyster Creek for the use and enjoyment of wildlife and human visitors alike. Located in Sugar Land, Cullinan Park is one of the largest nature parks in the Houston area. Learn more about the amenities at this beautiful nature park. 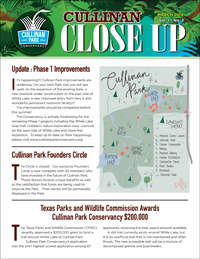 Donations work toward enhancing the natural beauty of Cullinan Park by supporting conservation efforts, trail maintenance, structure repairs and more. Make your tax-deductible donation today! Cullinan Park in Sugar Land supports a wide variety of wildlife within the nature park. home. Views photos of animal residents. Several nature trails allow visitors to explore the flora & fauna of the park. View our collection of trails maps and visitor information to plan your visit. Stay up to date with the latest news and information about Cullinan Park. As a non-profit organization, the Cullinan Park Conservancy relies on the work of volunteers to maintain and support the park. Learn more about volunteering with CPC.